DK's 15 Minute Japanese--now relaunching with a new free audio app--is the perfect course for busy people who want to learn Japanese fast. Twelve themed chapters are broken down into easy-to-follow 15-minute daily lessons, spanning a range of practical themes, including socializing, doing business, food and drink, travel, and shopping. The free audio app enables you to hear Japanese words and phrases spoken by native speakers. You can also record yourself, compare with native speakers, and re-record as desired. Use the app alongside the book's easy-to-use pronunciation guides to perfect your pronunciation, and to practice Japanese conversation in real-life situations. 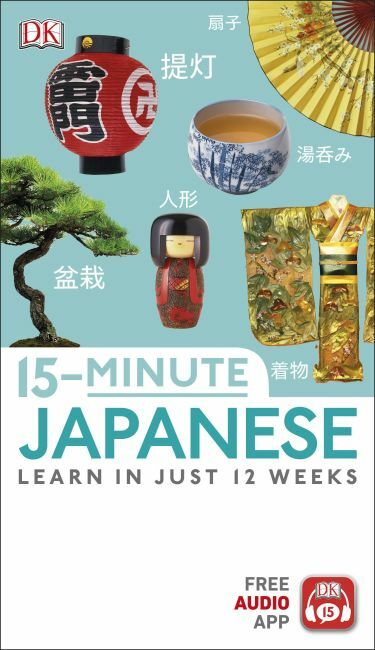 Whether you're starting from scratch or just in need of a refresher course, there's no easier way to learn Japanese than with 15 Minute Japanese.